​From time to time, small pricks and jolts of pain can surface throughout your body seemingly at random. While they can be quite the nuisance, they are for the most part quite insubstantial. A knee throbbing could mean you’ve been overusing it today. Perhaps your shins hurt from too far of a run or walk. Heck, your back can have small spurts of pain if you slept on it wrong. But when it comes to a toothache, there’s not much more of an indicator out there to something major being wrong with your dental health. So what’s causing the pain underlying the soft throb of your tooth, then? For the most part, you can almost guarantee that it’s a cavity. A lot of the times people think that cavities are extremely visible dark spots on the surface of a tooth. 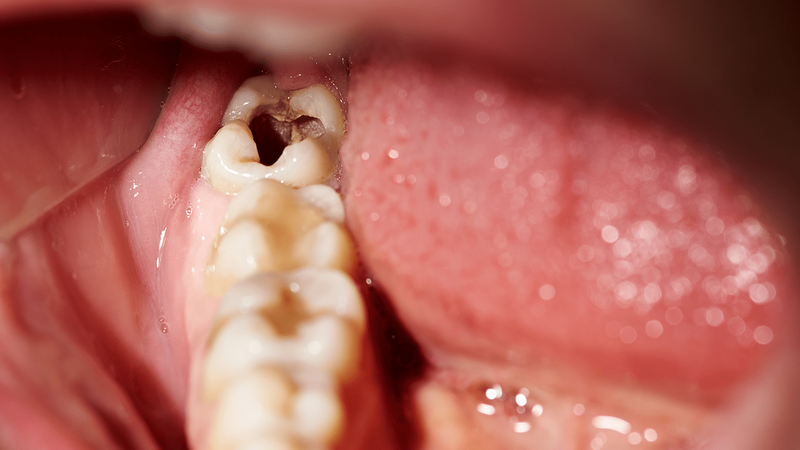 While this isn’t necessarily wrong, it’s the fact that cavities can often be hiding in between teeth, preventing you from ever noticing the dark spot. ​There’s nothing quite like a tooth aching from a cavity, though. If you bite down too hard, take a sip of something too hot or cold, or even chew a certain type of rough food and it gets between your teeth, you’ll find yourself wincing immediately and perhaps even holding your hand to your jaw. It’s a really distinct and painful feeling, is all there is to it. And the biggest bummer of it all is that it affects your eating. You never truly realize how amazing your mouth and teeth are until you have a bad pain in your mouth or teeth while eating. Because then, eating becomes quite the chore and is something you don’t look forward to since you know pain will be there. ​In fact, though it wasn’t a toothache in particular, I recall having quite a rough period back in high school with a mouth pain. There was some sort of swelling on the roof of my mouth that persisted for up to two weeks and dentists and doctors really didn’t know what it was. But it affected my eating, causing me to lose close to 15 pounds in that period simply because I couldn’t eat anything without it hurting. I lost my appetite entirely because of how painful it was to eat anything. No matter how soft or mild temperatured the food was, I couldn’t do it. Even soups were tough for me. In fact, the moment I finally broke down and cried was when I saw a box of Oreo Cakesters in my cabinet at home and wanted to eat them so badly but knew that I wouldn’t be able to chew them. Overall, any sort of mouth pain or tooth pain can really put a damper on eating anything, no matter how good the food is. Stay ahead of your pain by keeping good tabs on your dental health and seeing your dentist biannually.